Cunningham | Quill Architects won a 2012 Congress for the New Urbanism (CNU) Charter Award for the Mount Rainier Mixed-Use Town Center Development Plan. Lee Quill FAIA and Nandor Mitrocsak AIA represented Cunningham | Quill Architects and received the award on May 10, 2012 in West Palm Beach, Florida. 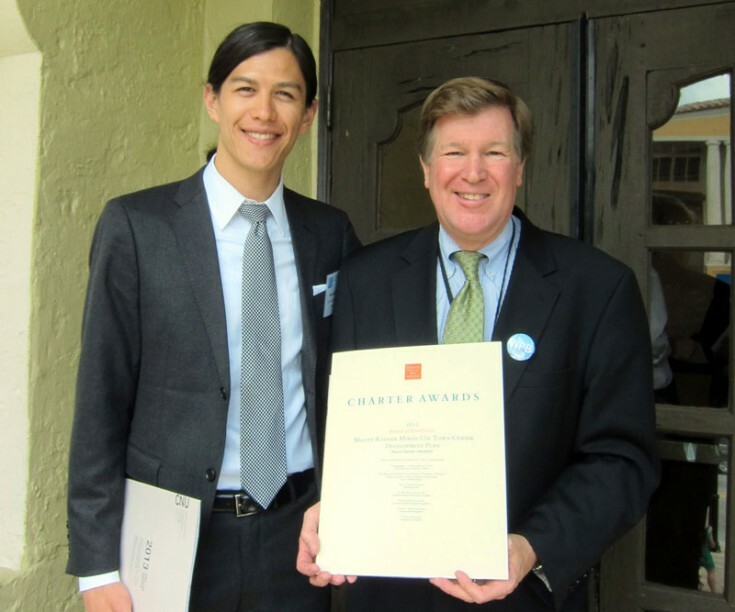 This is the second CNU Charter Award the firm has received. Starting in 2009 Cunningham | Quill Architects worked with the Maryland-National Capital Park and Planning Commission and the city to create a new vision for downtown Mt. Rainier over the next 15 years. Today the project enjoys strong city, county, and community support and has been adopted as a prototype and template for other mixed-use town centers in Prince George’s County, Maryland. To learn more about the CNU Award please visit the Congress for the New Urbanism website.